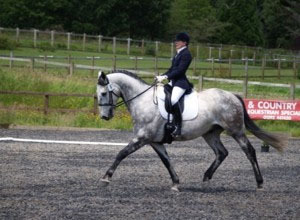 Lucinda riding “Bowhayes Pioneer” in the Lucinda McAlpine dressage saddle. The first Grand Prix Dressage Rider to take the shoes and rugs off her horses, Lucinda has become one of the country’s leading experts in Natural Horse Management. Over the last fifteen years her work has extended into the fields of diet, fitness, injuries and rehabilitation as well as behavioral work and we have been with her all the way, designing a saddle especially for her 2003. Working everyday with between 20- 40 horses and ponies of various breeds, ages and types over this period has given her much experience of the benefits of a more natural lifestyle for the horse in comparison to the more conventional horse management systems that she studied for the previous 30 years. In more recent years Lucinda’s research has focused on her home bred horses. Having 3 groups of full brothers and sisters means that she can fully explore the effects of ‘Nature or Nurture’ in relation to health, temperament, performance and longevity for the modern competition horse. Hi Lucinda – We met (over the telephone some years ago) when I wanted to attend one of your clinics before you moved….yes, a long time ago!! We live in Sotogrande, Spain now and I was wondering if you sell saddles for polo ponies? Hi Jane, yes we do. please have a look at http://www.reactorpanelsaddles.com/products/saddles/reactorpanel-polo-saddle/ we would also be happy to come and fit it for you.